Do not love the world or the things in the world. If anyone loves the world, the love of the Father is not in him (v. 15). Do Not Love "the World"
Everyone who claims to be a Christian would say they love God. But if we examined everything we did during the past week, how evident would it be that we love God? Authentic love is more than words or feelings. Love is demonstrated by our actions. Am I really devoted to God? John writes, “Do not love the world or the things in the world” (v. 15). (In this context, “the world” does not mean people, as in John 3:16, or the earth.) In verse 16, John tells us what is “in the world”: (1) “the desires of the flesh,” (2) “the desires of the eyes,” and (3) “pride in possessions.” To “love the world” is to have the values of the world (i.e., to live for what the world is living for). Loving “the world” is idolatry. Tim Keller often says that idolatry is “turning a good thing into an ultimate thing.” An example of an idol is home improvement. Lowe’s slogan is “Never stop improving.” Home improvement is a good thing, but we shouldn’t turn it into an ultimate thing. To some a store like Lowe’s is a temple, and home improvement is their god. John gives two reasons why we shouldn’t worship idols (i.e., love the world). 1. We can’t love God while loving an idol. “We are not created to worship, but rather we are created worshiping” (Mark Driscoll, Gerry Breshears, Doctrine, 339). Everyone is a worshiper. Jesus said, “Where your treasure is, there your heart will be also” (Matt. 6:21). Our heart is to be devoted to God, not idols. Jesus said that the greatest commandment is “You shall love the Lord your God with all your heart and with all your soul and with all your mind” (Matt. 22:37). If we are devoted to idols, we are not devoted to God. “If anyone loves the world, the love of the Father is not in him” (v. 15). A common idol is money, and Jesus said, “You cannot serve God and money” (Matt. 6:24). 2. Idols always end up disappointing us. All that this world offers is temporary (as the rich farmer in Jesus’ parable discovered, Luke 12:16-21). “The world is passing away along with its desires” (v. 17). Most people eventually discover that idols leave us frustrated and unsatisfied. In 2005, novelist David Foster Wallace gave a speech to the graduating class at Kenyon College. Near the end of the speech he said the following. “In the day-to-day trenches of adult life, there is actually no such thing as atheism. There is no such thing as not worshipping. Everybody worships. The only choice we get is what to worship. And the compelling reason for maybe choosing some sort of god or spiritual-type thing to worship … is that pretty much anything else you worship will eat you alive.” Wallace hanged himself in 2008 at the age of 46. “But whoever does the will of God abides forever” (v. 17; cf. 1 Cor. 7:31). Doing the will of God is the opposite of idolatry. The frustration and dissatisfaction of idolatry should drive us to God. Whoever says “I know him” but does not keep his commandments is a liar, and the truth is not in him, but whoever keeps his word, in him truly the love of God is perfected. By this we may know that we are in him (vv. 4-5). In 1 John 2:3-11, the apostle John addresses three claims that people were making in his day. He introduces each of these claims with the words “Whoever says”: “Whoever says ‘I know [God]’” (v. 4), “Whoever says he abides in [God]” (v. 6), and “Whoever says he is in the light” (v. 9). Sometimes these claims were true, and sometimes these claims were false. In this passage, John helps us identify if our claim to be a Christian (i.e., someone who possesses eternal life) is true or false. I’m sure you’ve seen lots of commercials for “As Seen on TV” products, such as the ShamWow (“holds 20 times its weight in liquid”), Magic Mesh (“the new type of screen door that opens easily and then magically closes itself behind you”), Mighty Putty (“seals leaks instantly”), and the Snuggie (“keeps you totally warm and gives you the freedom to use your hands”). There are many people in this world who go to church every Sunday and claim to be Christians but are not authentic Christians. If our Christianity lacks love, it’s not authentic Christianity. Christians should be people who strive to love God and others. 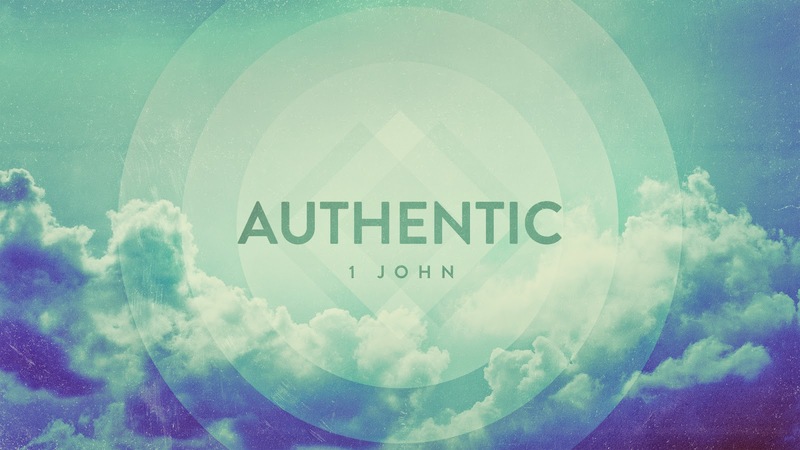 How can we display the love of authentic Christianity? 1. We should obey God’s commands because we love him (vv. 3-5a). This week, basketball player Kevin Durant received the NBA’s Most Valuable Player award. During his acceptance speech, he said the following words about his mother: “You made us believe. You kept us off the street. You put clothes on our backs. You put food on the table. When you didn’t eat, you made sure we ate and [you] went to sleep hungry. You sacrificed for us. You’re the real MVP.” I’m sure Durant’s love for his mom affects how he responds to her. In a similar way, our love for God should affect how we respond to his commands. “Whoever keeps [God’s] word, in him truly the love of God is perfected” (v. 5). “Keeps” is in the present tense, which means that John is referring to an ongoing obedience (not a perfect obedience). “The love of God” probably refers to our love for God. Jesus said, “If you love me, you will keep my commandments” (John 14:15; cf. vv. 21, 23, 24). “When we have discovered God’s inexhaustible love for us, we love him utterly, and this is expressed tangibly in obedience to his will” (Gary M. Burge, The Letters of John, 99). 2. We should love others as Jesus has loved us (vv. 5b-8). We “ought to walk in the same way in which [Jesus] walked” (v. 6). Our “walk” refers to the way we live. Jesus said to his disciples, “A new commandment I give to you, that you love one another: just as I have loved you, you also are to love one another. By this all people will know that you are my disciples, if you have love for one another” (John 13:34-35). Jesus called this command “a new commandment,” but John calls it “an old commandment” (v. 7) because his readers had it “from the beginning” (v. 7). The “beginning” probably refers to the time when they first heard the gospel. John says that this commandment was “true in [Jesus] and in [his readers]” (v. 8). The meaning of “true” might be “truly expressed” (Colin Kruse, The Letters of John, 83). 3. We should love the unlovely (vv. 9-11). “Whoever loves his brother abides in the light” (v. 10), but “whoever hates his brother is in the darkness” (v. 11). There would be no hatred if everyone was easy to love. Jesus asked, “If you love those who love you, what reward do you have?” (Matt. 5:46). The ultimate test of our love is whether or not we are able to love the unlovely. “Love becomes a genuine value only when it is tested, only when we must reach beyond ourselves and love someone we do not wish to love” (Burge, 101). Is the claim that you’re a Christian a true claim? Will God Ever Disown Me? My little children, I am writing these things to you so that you may not sin. But if anyone does sin, we have an advocate with the Father, Jesus Christ the righteous. He is the propitiation for our sins, and not for ours only but also for the sins of the whole world (2:1-2). Recently, there was a story about a grandfather disowning his daughter for disowning her son. In my opinion, both the grandfather and the mother acted wrongly. Children sometimes cause their parents great disappointment, but that doesn’t give parents a right to disown their children. How does my sin affect my relationship with God? If God is my Father and I am his child, will my disobedience ever cause God to disown me? In 1:5, John states that “God is light.” “Light” is a metaphor for God’s moral perfection (holiness). God hates sin. (John defines sin as “lawlessness” in 3:4.) But John also says that “God is love” (4:8). In 1:6-2:2, John tells us what we must not do when we sin. 1. We must never deny our sin. Often when a parent asks a child if he has done something wrong (e.g., stole a cookie from the cookie jar), the child will deny his sin (even if the evidence is all over his face). Sometimes the denial of the sin is worse than the sin itself. In contrast to these people who denied their sin, John says that God’s children “walk in the light” (v. 7). Colin Kruse writes that “walking in the light” (cf. John 3:19-21) involves a “willingness to be open towards God” (The Letters of John, 63). We can’t be forgiven unless we “confess our sins” (1:9). God forgives all confessed sin (“cleanses us from all sin,” 1:7; “cleanses us from all unrighteousness,” 1:9). “Cleanses” is in the present tense, which means the forgiveness is an ongoing activity. 2. We must never diminish the seriousness of our sin. If God will forgive all my sin, does my sin really matter? Yes, every sin is an insult against the blood of Jesus. We should never be content in our disobedience. (If we are content in our disobedience, do we really have the Holy Spirit within us?) John writes, “My little children, I am writing these things to you so that you may not sin” (2:1). So often we downplay the holiness of God and our sinfulness (cf. Isa. 6:1-7). 3. We must never despair when we sin. When we do sin, Christ is our “advocate with the Father” (2:1), and he is “the propitiation for our sins” (2:2). In paganism, a “propitiation” was a sacrifice that appeased the wrath of a god. Christian propitiation is different. God is the one who provides the propitiation. Later, John writes, “In this is love, not that we have loved God but that he loved us and sent his Son to be the propitiation for our sins” (4:10). An “advocate” is someone who speaks on behalf of an accused person. (The Greek word for “advocate” is parakletos. The word is used as a title for the Holy Spirit in John’s Gospel.) Our advocate is described as “the righteous one” (2:1). Jesus, the righteous One, “now stands in the presence of the Father to speak on behalf of those who have not acted righteously” (Kruse, 73). If we don’t think it’s right for a human parent to disown his or her child, why would we think that God would ever disown one of his children? We become God’s children by grace, and we remain God’s children by grace. We enter into God’s family through faith in Christ. This means our confidence is based on what Christ has done for us, not on what we do for God. No, God will never disown one of his children. Does this mean that our obedience to God is unimportant? No. God’s grace affects our motivation for obedience. Our motivation for obedience to God should be love, not fear.